Updates to the site will continue for the next few weeks. I will upload pictures to the Student pages, add students insights and perspectives, and add additional information to blog posts from my journals etc. Thanks for reading over the past few weeks! Starting just north of Paro and leaving the valley floor, the trail to Taktsang contours around the hills below the temples of Taktsang. 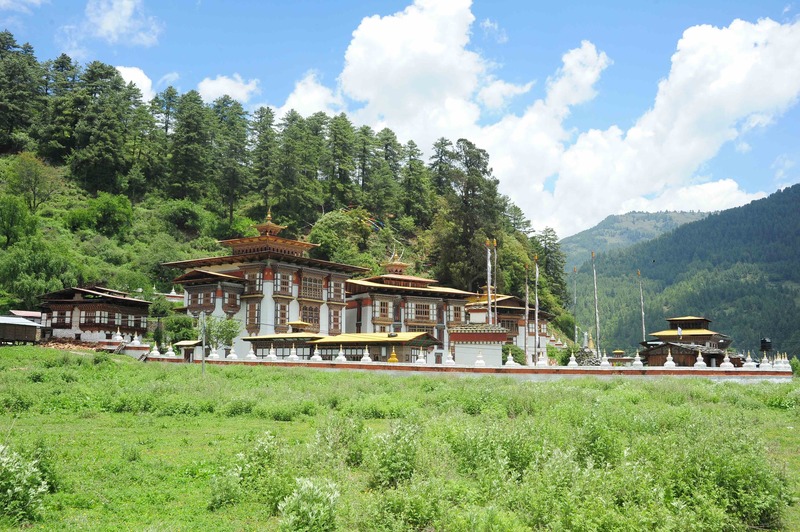 The buildings were constructed to commemorate the meditation of Padmasambhava and his consort Tsogyal Yeshe. 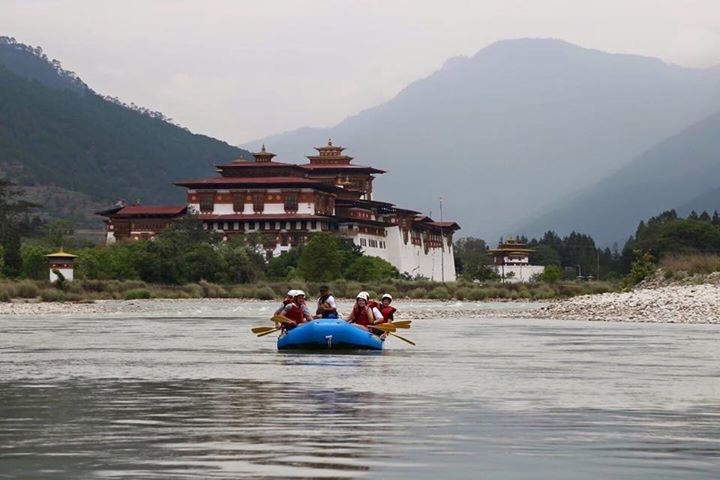 They both stayed at this place, and according to legend subdued demons in the Paro Valley, brining Buddhism to the western part of Bhutan in the 8th century. 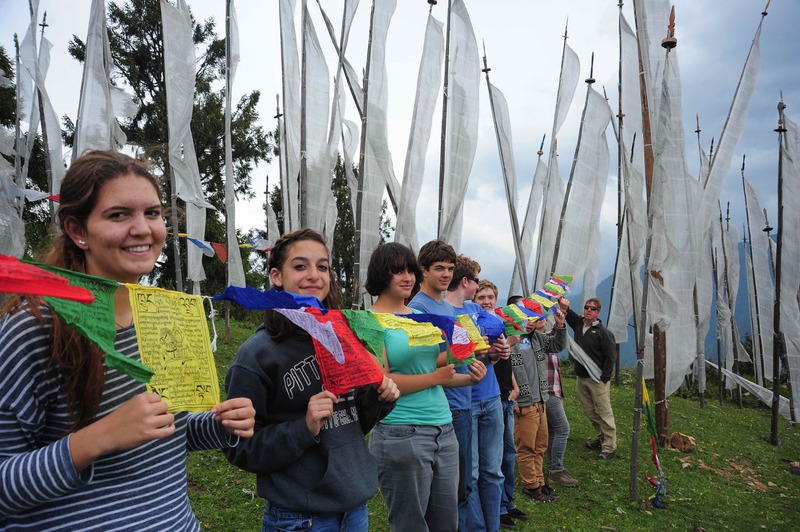 The hike is meant as a kind of pilgrimage to remove sins or bad deeds. WE can certainly vouch for the struggles associated with the climb. The trail is straight up the side of the surrounding hills, and there is very little respite from the climb. 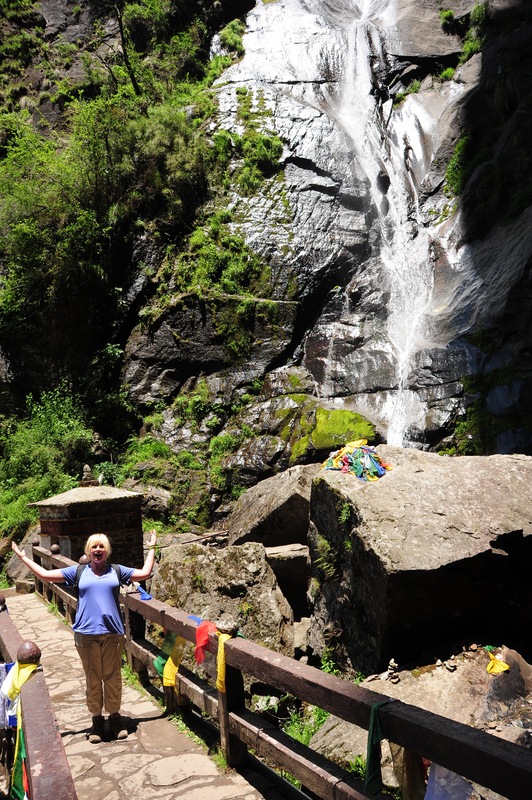 On the trail to Taktsang…the lower stretch of the trail. 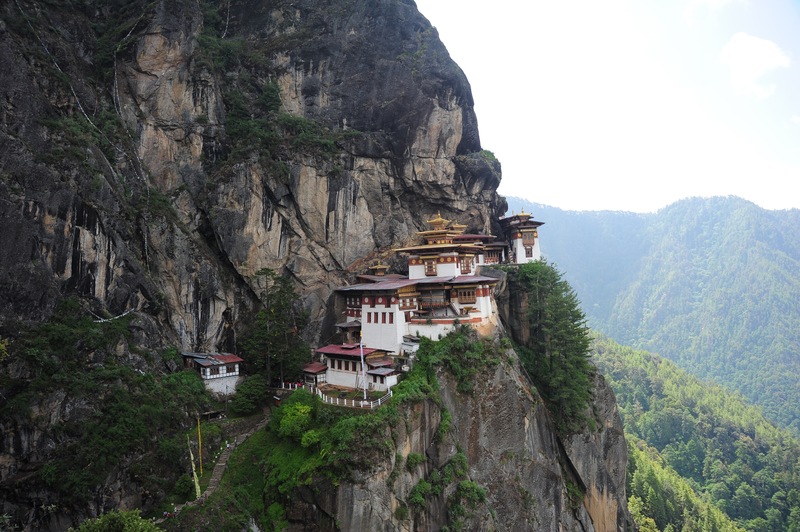 However, about half way into the journey, the trail reveals a tea house perched on the side of a cliff. As has been a part of our trip each day, we stopped for tea and biscuits, sat down at the tables and looked toward the temple. After the tea house the trail turns up again, steeply climbing until you are actually above the temple….lest you think things get easier, they don’t. A hundreds of steps lead around the opposite cliff side and descends down about 200 feet before climbing again on the other side of a waterfall toward the temple itself. I think the biggest hurdle here are the various widths and heights of the steps….some small some large, some ridiculously high…at times it’s a real struggle to reach the next step. 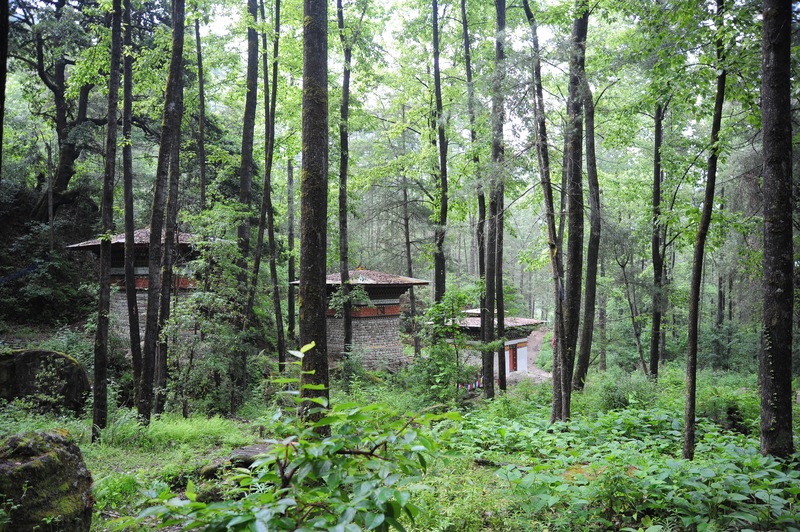 Once at the temple, a series of shrine rooms await with various deities and statues inside….the main temple houses an ancient statue of Padmasambhava that, according to legend, remained even after fires destroyed the temple around it (the last one in 1998). 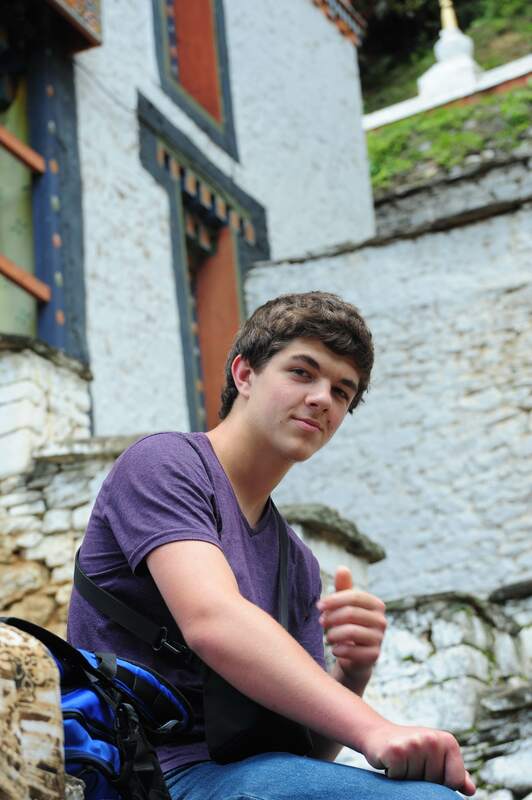 Layla crossing the bridge to Taktsang. Our trip down was a bit shorter and a catered meal awaited us at the base among the trees. 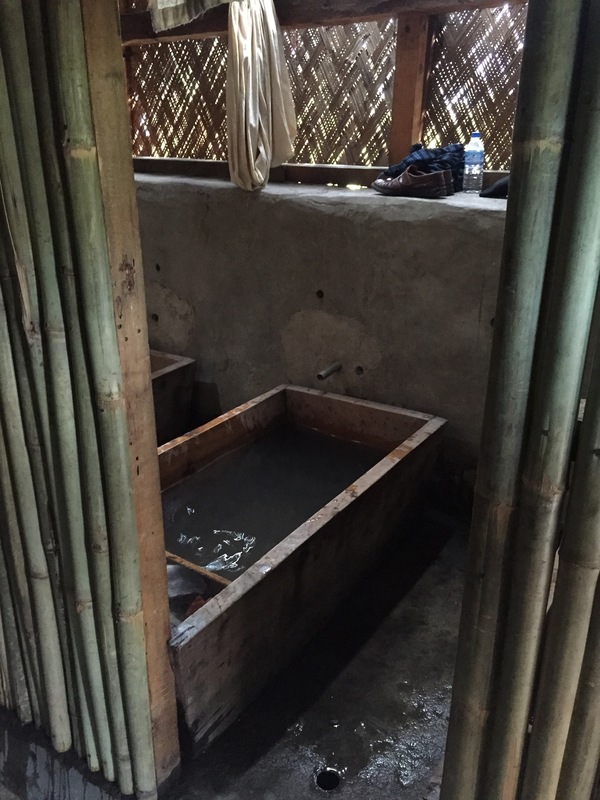 From there we went to soak in a traditional stone bath and finally our last dinner in Bhutan. We leave for Bangkok and then home. All are eager to see family and friends! 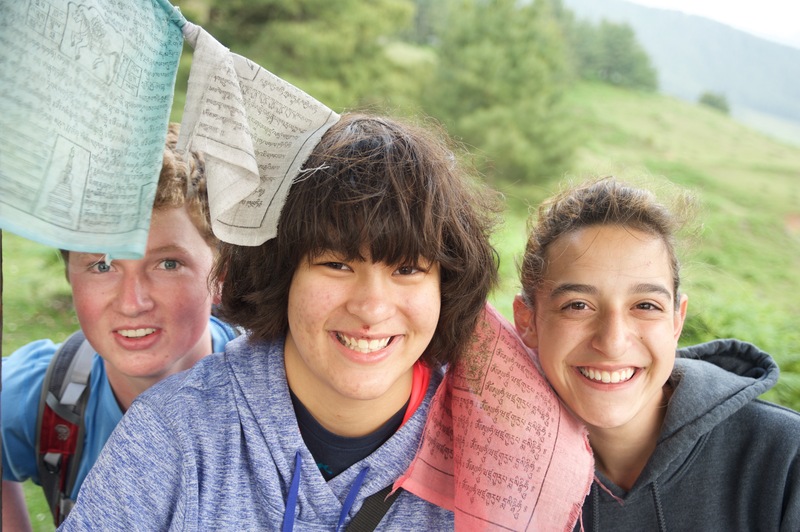 Leaving Bumthang and heading west represents the beginning of the end of our travels in Bhutan. Just about everyone commented on the fact that our trip is rapidly coming to an end. Yes we still have a couple of days left and yes we still have adventures to tackle AND we all can see the end of this experience and to a person we do not want it to end. On the trail through the Phobjikha Valley. Looking out across the valley to the north. 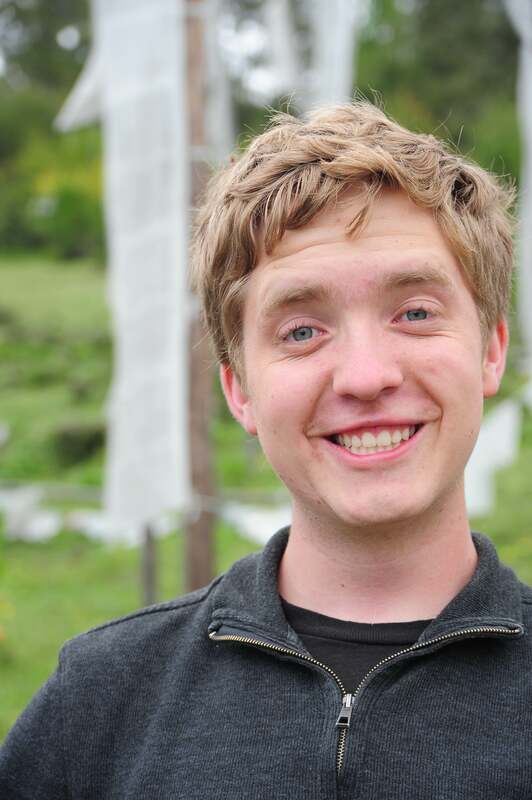 The Phobjikha Valley sits just south of the road into Trongsa and climbs to about 3500 M….the valley spreads out before you much like Valles Caldera….a wide, grass-filled valley with a stream running right through the middle of the place. The photos we took hardly do it justice. We hiked from the local temple, about 4 km to the valley floor. Once we reached it, we found a small group of folks playing soccer. Our football ambassador, Austin, wanted into the match….so we joined. 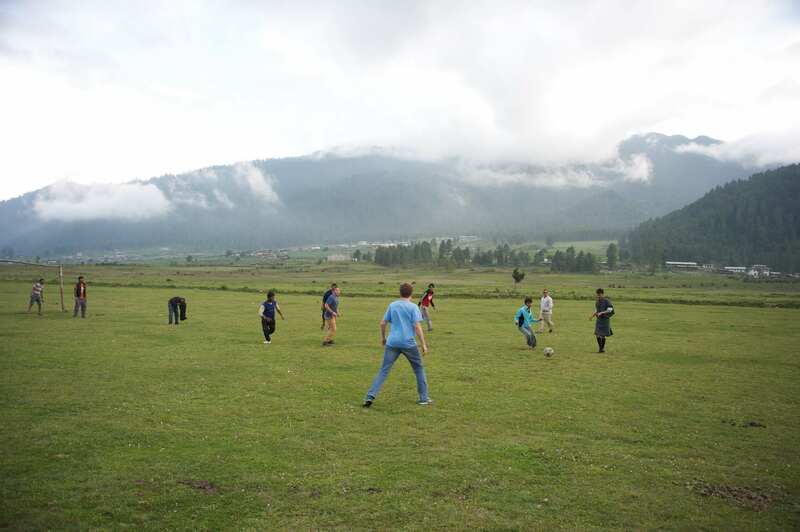 That hour on the field was among the most remarkable moments of the trip….playing football in the middle of the Phobjikha Valley…as you will see, an idyllic setting. 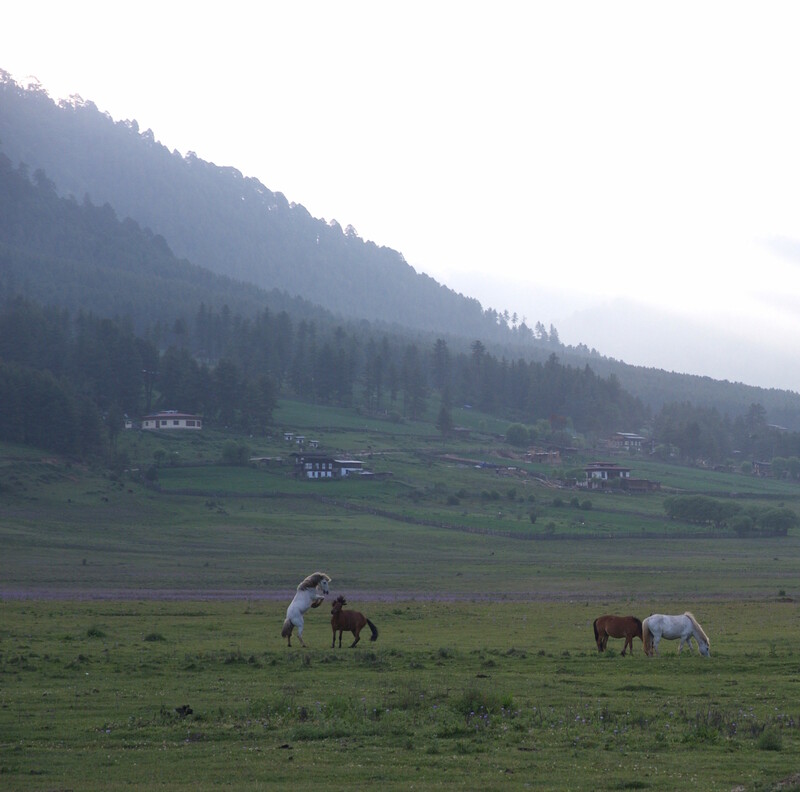 At exactly the same time, a group of horses galloped into the valley from the surrounding hills and frolicked in the grass and marsh. It was surreal to see the game going on while horses played nearby….another amazing experience on a trip filled with them. 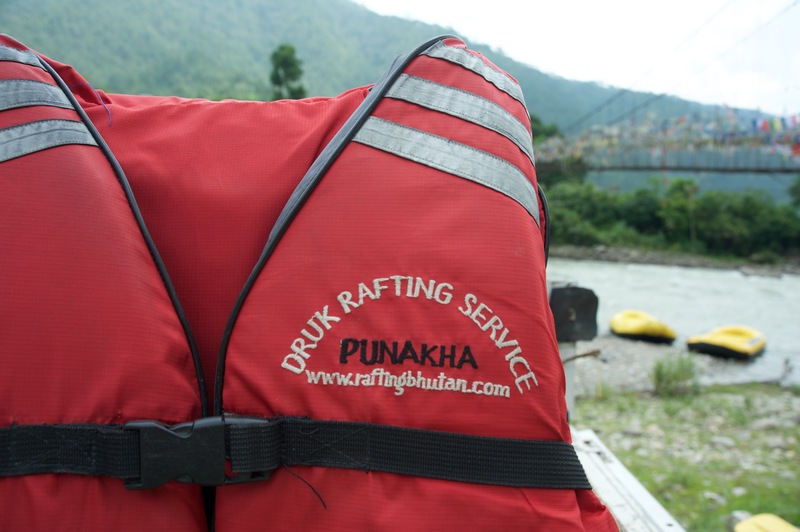 The next morning we left very early for our travel to Punakha and a date with Druk Rafting Service. 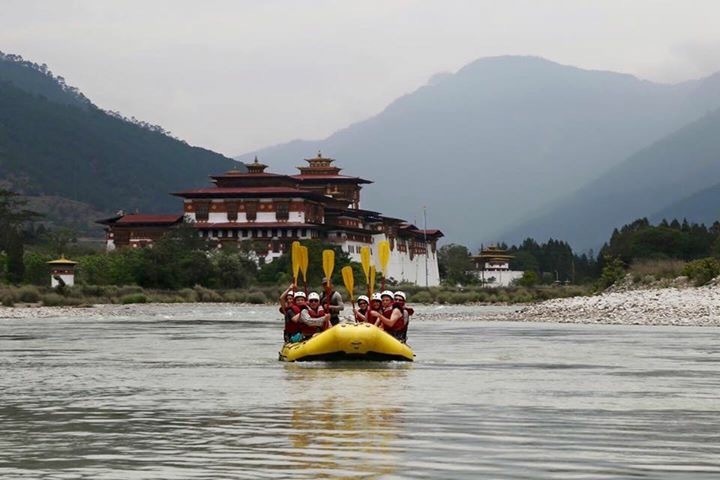 We rafted the Mo Chu river….the experience was wonderful and we paddled our way past temples and dzongs, seeing the royal sheep (no joke) a mongoose, and other fowl and beasts. 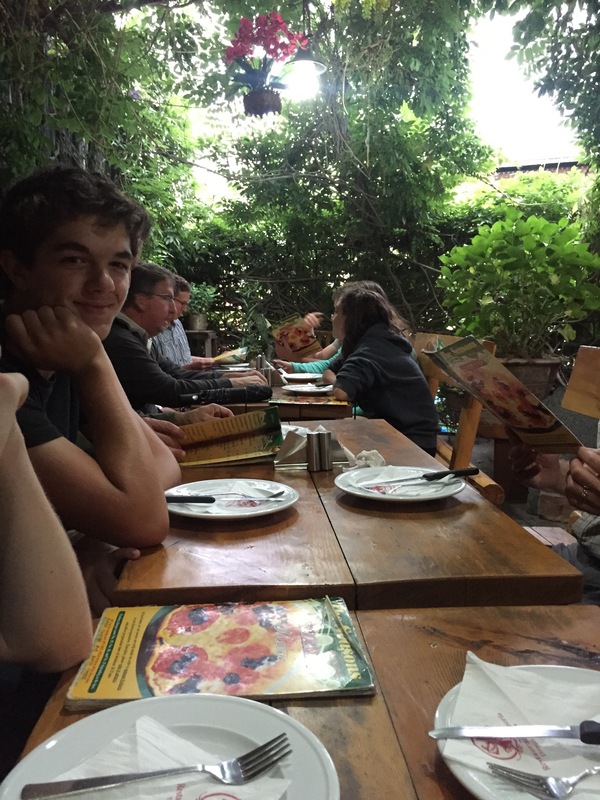 By the time we made it to Thimphu to eat, of all things, pizza, we were fairly spent. 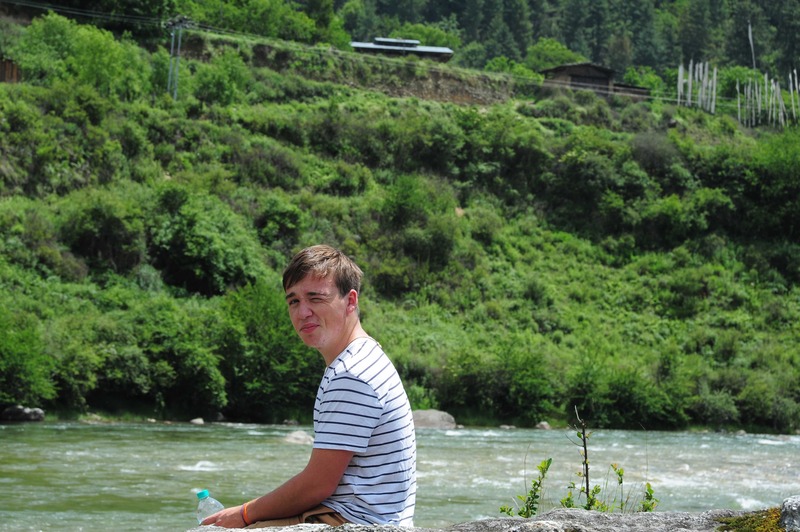 Tomorrow, we head up to the Haa Valley and, hopefully, a clear view of the Himalayas. 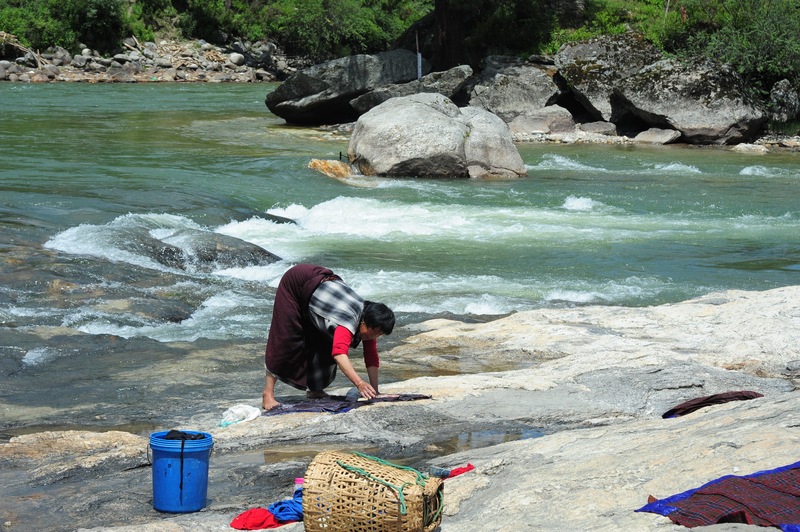 Washing clothes along the river in Bumthang. 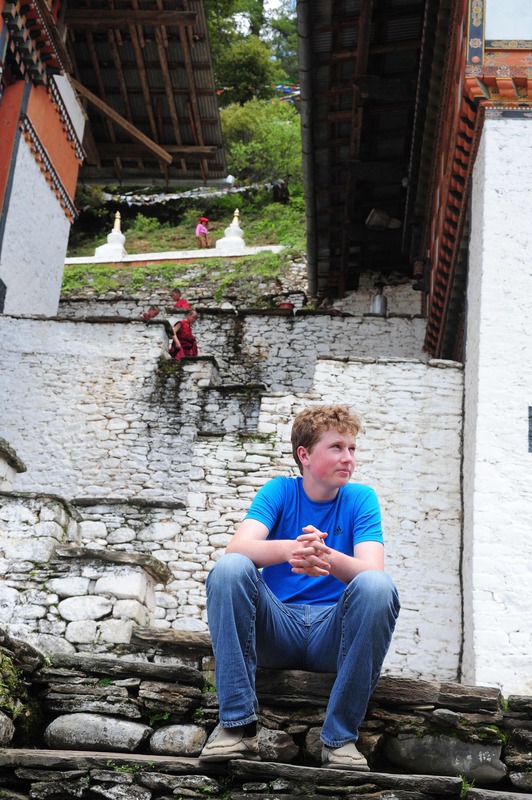 Sitting high on a hill overlooking the town of Chamkar is the Chamkar Dzong. The building, massive in construction, is a kind of beacon one can see across the valley. The building was placed on that site when a white (Cham) bird (kar) settled on the hill. The builders, searching for a site for the Dzong, chose that site after seeing this auspicious omen. Contemplating why he has to sit for another picture. Outside Kurjey Lhakang on the way toward town. 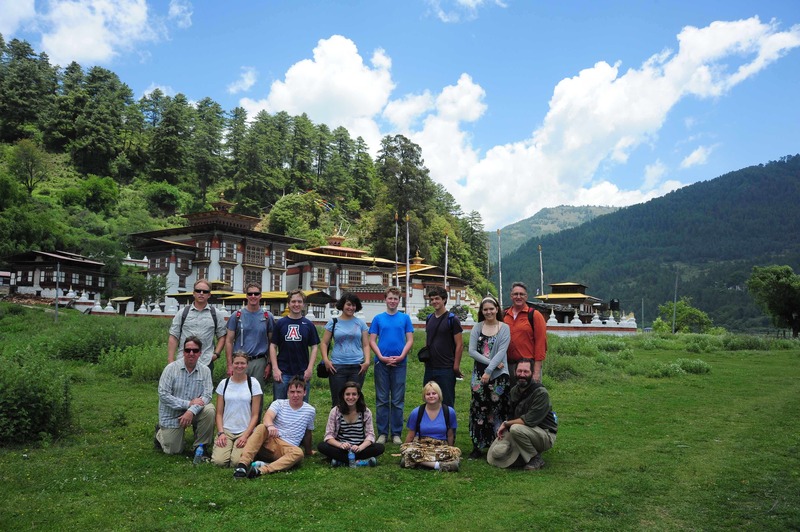 Our group spent time hiking around the valley, visiting Kurjey Lhakang Temple and two other temples dedicated to Padmasambhava. We walked across a suspension bridge that led to the temple grounds. 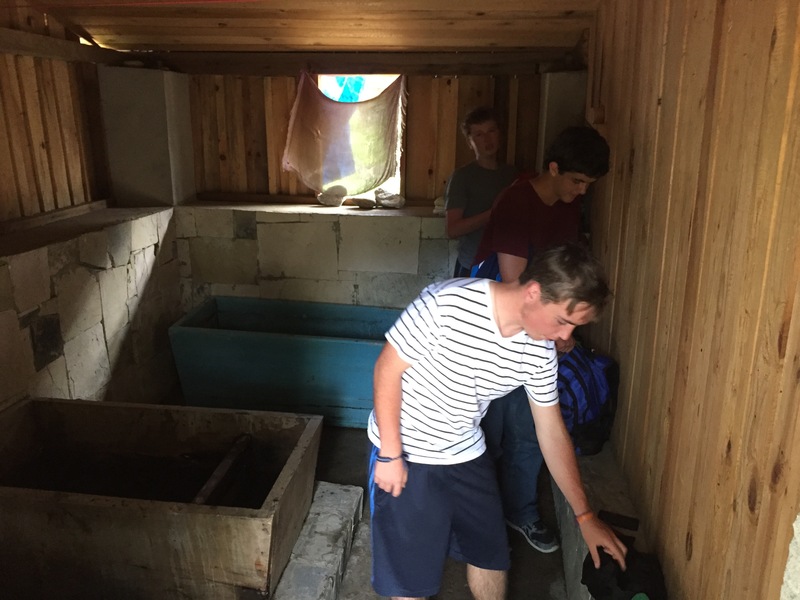 The Queen mother was meditating at the temple and we could not spend time in the shrine room dedicated to Padmasambhava…we did, however, go through the cave in the temple that Padmasambhava meditated in…that was a tight fit for most of us! 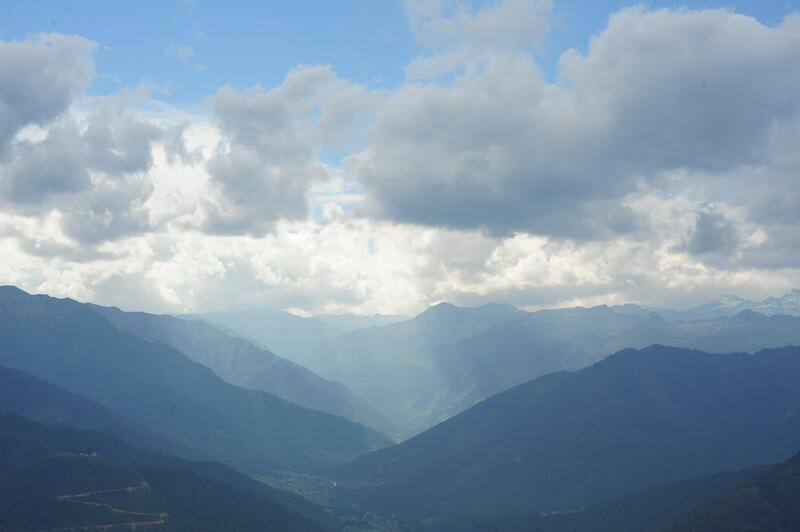 The sky in Chamkar is much like New Mexico….crystal clear blue skies, white billowy clouds stretching across the sky….a truly magical spot in Bhutan. If you wonder where Shangri-la is, I’m pretty sure it’s near this wonderful town. The wonderful thing about the day today is that we got to visit a couple of shrine rooms that few people ever get to see. The inner sanctum at Kurjey, and the shrine rooms at the other temples were all opened to us. Unfortunately we could not take pictures of those places; however, the energy in those spaces is powerful (if you accept such an idea). 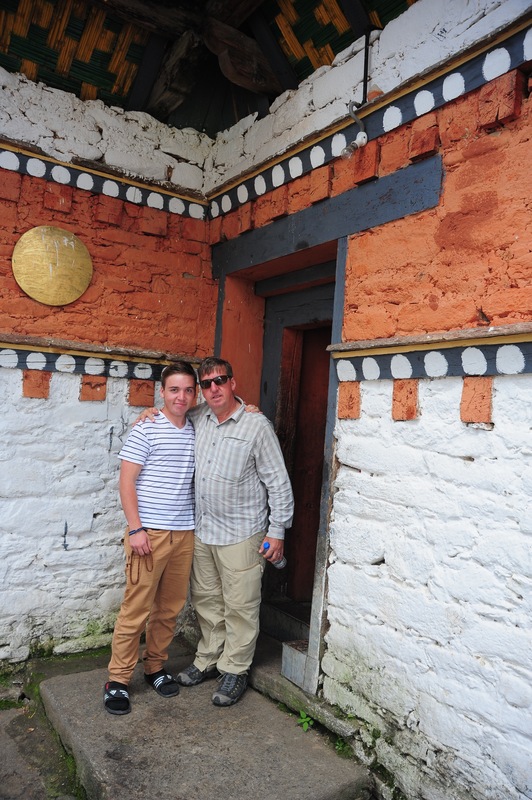 Some of us were in awe of the moments we spent in these temples. The other thing we have seen more of on this trip are monks chanting in the temples…we have been lucky enough to have the chance to sit and listen to the chants. Those moments are so full of stillness (if you get my meaning). 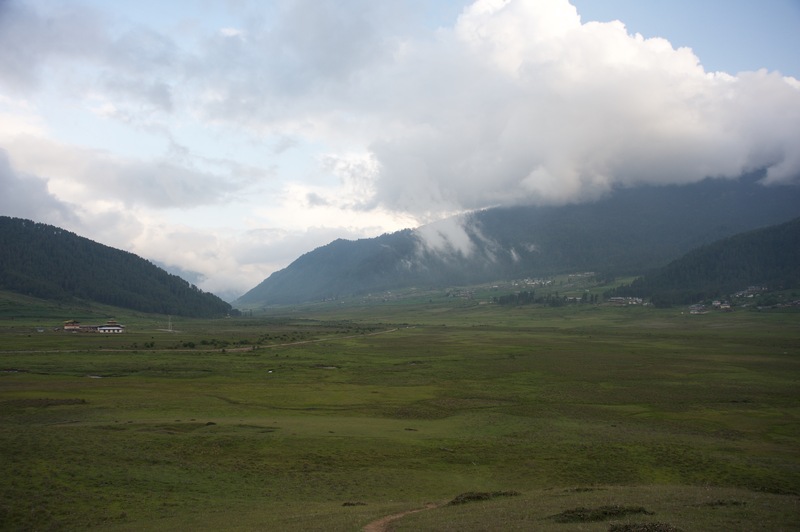 A view of Kurjey from the cow pasture in front of the temple….Padmasambhava’s cave is on the far right. 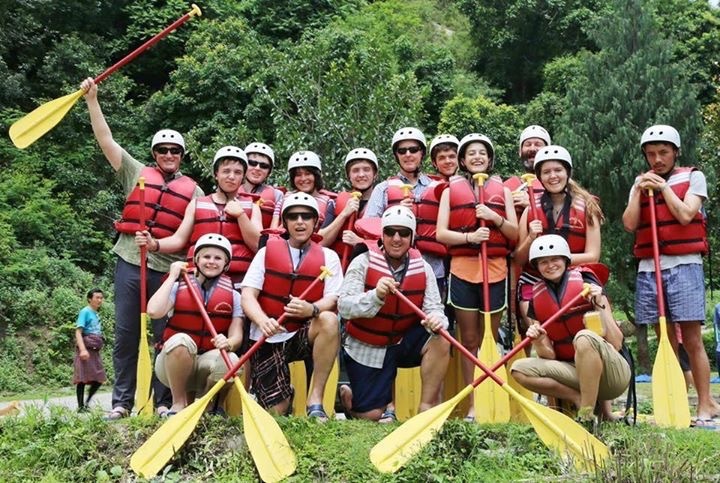 Our day tomorrow sends us off to the Phobojika Valley. This valley is a nature preserve that is the home of the black-necked crane. Hopefully, we will see one or two of the birds. Our hike takes us around the valley floor and through the nature preserve filled with all kinds of animals including the elusive Bengal tiger. We are NOT searching for that particular animal! Posting photos has been very limited. Maybe tomorrow I can catch up on the photo posts!